Long-term unemployment is one of the most persistent consequences of the Great Recession, particularly in Spain, where external factors were compounded by domestic problems. This column analyses the mechanisms that worked to create such widespread and persistent long-term unemployment. To improve the prospects of the long-term unemployed, Spain should step up its efforts to implement effective active labour market policies. One of the most tangible legacies of the Great Recession is a surge in the incidence of long-term unemployment, especially in Spain. This is not a new problem – as the title of the 1995 CEPR report, Spanish Unemployment: Is There a Solution?, attests (Andres et al. 1995) – but it is a massive challenge. In 2016Q3, 47% of the unemployed in the European Union (EU) had been seeking work for more than one year. Long-term unemployment is a major challenge for policymakers. Since the probability of finding a job tends to drop markedly with unemployment duration, many of the affected workers may soon have very limited chances of reemployment, which entails a risk for social cohesion and may lead to high structural unemployment rates. A recent VoxEU eBook (Bentolila and Jansen 2016) highlights the large heterogeneity in the incidence of long-term unemployment across the EU. Spain, alongside Greece, is one of the countries that stands out. In the worst moment of the crisis, the unemployment rate reached a staggering 27% of the labour force, and at its maximum point long-term unemployment comprised 62% of the unemployed. While the employment situation has improved considerably over the last three years, the share of long-term unemployed is still 57%. The proximate causes of this dismal performance include, as in many other EU countries, the external shocks represented by the Global Crisis and the Eurozone crisis. But in the case of Spain the effects of these external shocks were compounded by the bursting of a housing bubble and a large-scale banking crisis. Furthermore, the shocks interacted with institutional factors, such as a strongly segmented labour market and a rigid system of collective bargaining, which resulted in a massive destruction of temporary jobs, especially in construction, and delays in the adjustment of negotiated wages. Taking these factors as given, in a new paper we analyse the mechanisms that fuelled the build-up, and explain the persistence of long-term unemployment (Bentolila et al. 2017). The Spanish Labour Force Survey (LFS) data reveal a strong negative correlation between the exit rate from unemployment to employment and the duration of unemployment. A key question is to what degree the low outflow rates of the long-term unemployed result from the lack of demand in the crisis, through negative duration dependence (namely, that the exit rate of individual workers truly falls with spell length). Alternatively, such low rates may reflect a mismatch between the skills required by firms and the skills that the unemployed can offer. The two mechanisms can be confounded due to dynamic selection, namely, that over time, the composition of the pool of unemployed worsens, as the most employable workers leave first. Distinguishing between the two potential causes is vital from a policy viewpoint, but far from trivial empirically (Machin and Manning 1999). While recent US studies implement augmented search and matching models to answer this question (e.g. Kroft et al. 2016), we estimate state-of-the art duration models with individual panel data. To account for selection, we jointly estimate models for the exit from unemployment and the exit from employment that take into account unobserved heterogeneity. Moreover, to accommodate the dual nature of the labour market, we distinguish between flows involving temporary and open-ended jobs. Our duration analysis is performed using the Continuous Sample of Working Lives, a large sample of social security records. A key advantage of using of social security data is that we are able to capture short-term worker flows that are mostly missed by the LFS. On the other hand, this source does not allow us to distinguish between unemployment and nonparticipation, but this is not an important shortcoming. There are large flows into and out of non-participation, but transition rates from employment to non-employment (i.e. unemployment plus nonparticipation) follow similar patterns as the traditional transition rates between employment and unemployment. Since in Spain the Great Recession reduced male employment significantly more than female employment, we restrict our analysis to the population of native prime-age males. We pay special attention to the changes taking place from the expansion (2001-2007) to the recession (2008-2014). According to our empirical results, the conditional probability of entering long-term unemployment rose substantially during the crisis, to a level of around one-quarter. Moreover, conditional on entering long-term unemployment, the chances of becoming very long-term unemployed (defined as being unemployed for at least two years) are even higher, around one-half. According to our results, advanced age, low experience, and entitlement to unemployment benefits are the three main risk factors that raise the chances of becoming long-term unemployed. The impact of low levels of educational attainment and skill is muted by the high level of turnover on temporary contracts, but once we restrict our attention to exits to jobs that last at least one month these factors are also found to raise the risk of entering long-term unemployment. Surprisingly, unemployed workers from construction do not fare worse than similar workers from other sectors. The reason seems to be their high turnover rate – almost 60% of jobs in construction last less than three months, compared to 44% for the other sectors. Thus, temporary jobs act as an informal work-sharing arrangement, allowing construction workers to find work and thus avoid entering long-term unemployment. Returning to our initial question, we find – similarly to the recent literature on long-term unemployment in the US – that duration dependence and not dynamic selection is the main source of the low job-finding rates of the long-term unemployed. During the first year in unemployment, the monthly hazard of the average individual drops by around one half, and it halves again during the second year. This points towards lack of demand as a key determinant of long-term unemployment. Aggregate demand does, however, affect workers differently depending on their unemployment duration. 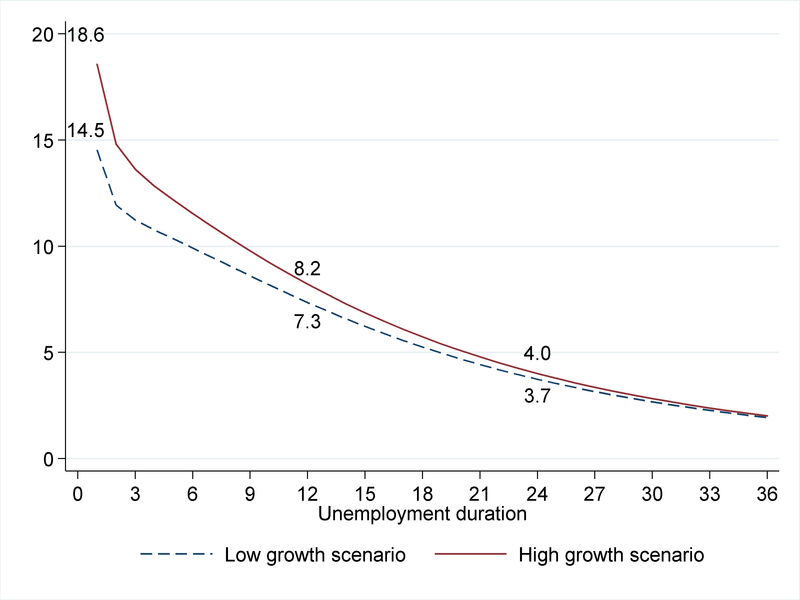 Figure 1 depicts the monthly exit rate from unemployment, showing that workers who have been unemployed for one month leave 28% faster in a high-growth scenario than in a low-growth scenario, those unemployed for one year leave 12% faster, and those unemployed for 24 months leave only 8% faster. Therefore, a cyclical upturn does not help the long-term unemployed much. In our final estimation exercise we use a different data set, the Spanish Survey of Household Finances, to examine the wages at which unemployed workers are willing to work, over the period 2002-2011. Two salient findings from this analysis are that self-reported reservation wages are not very responsive to the worker's own unemployment duration, whereas they do react strongly to the aggregate state of the economy. The latter result is consistent with the large fall in workers' re-entry wages that was observed in Spain from 2010 onwards. Our estimates are the outcome of the interplay between labour demand and labour supply, and so we cannot disentangle the effect of each, and for this reason they cannot be directly used to derive policy prescriptions. But our estimates do imply that growth alone will not suffice to significantly raise the job-finding rates of the long-term unemployed and that there is limited room for further wage adjustments. The current low exit rates from long-term unemployment therefore entail a substantial risk of social and economic exclusion. As a result, we believe that to improve the prospects of the long-term unemployed, Spain should step up its efforts to implement effective active labour market policies. Indeed, the recent meta-analysis of Card et al. (2015a,b) indicates that active labour market policies can contribute significantly to the reduction of unemployment and, especially, of long-term unemployment. After a long period of inaction, the Spanish authorities have approved a three-year programme to offer individualised support to one million long-term unemployed. However, Spain has a poor track record in active labour market policies and its public employment services are outdated. These shortcomings need to be addressed before we can expect positive results from the new plan. With a view to the future, intensifying early activation of the unemployed is essential. In particular, this is crucial for unemployed workers who receive benefits, so that they avoid reaching spell lengths at which, due to duration dependence, low exit rates condemn them to enter and remain in long-term unemployment. Andres, J, O Blanchard, and J F Jimeno (1995), Spanish Unemployment: Is There a Solution?, CEPR Press, London. Bentolila, S, and M Jansen (2016), Long-Term Unemployment After the Great Recession: Causes and Remedies, CEPR Press. Bentolila, S, J I García-Pérez, and M Jansen (2017), "Are the Spanish Long-Term Unemployed Unemployable? ", CEPR Discussion Paper DP11824. Card, D, J Kluve and A Weber (2015a), "Active Labour Market Policies and Long-Term Unemployment", in S Bentolila and M Jansen (2016). Card, D, J Kluve, and A Weber (2015b), "What Works? A Meta Analysis of Recent Active Labor Market Program Evaluations", IZA Discussion Paper 9236. Kroft, K, F Lange, M J Notowidigdo, and L Katz (2016), "Long-Term Unemployment and the Great Recession: The Role of Composition, Duration Dependence, and Nonparticipation", Journal of Labor Economics 34(S1), S7–S54. Machin, S, and A Manning (1999), "The Causes and Consequences of Long-Term Unemployment in Europe", in O Ashenfelter and D Card (eds. ), Handbook of Labor Economics (vol. 3), Elsevier, Amsterdam, 3085–3139.